The new Chinese built LDV V80 van being imported by the Harris Group. 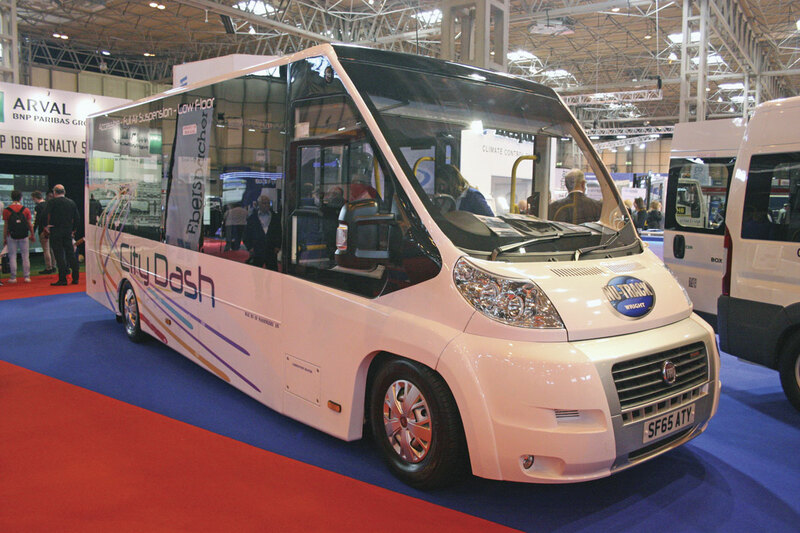 The Nu-Track City Dash directly wheelchair accessible minibus. The new 22 seat Stanford Iveco New Daily accessible minibus. The all electric EV80 will be available in minibus form from next year. Treka Bus Treka16 Sprinter van conversion for Essex County Council. The new Peugeot Expert mid sized van. The eight seat LDV G10 people mover. Sumptuous interiors of two Stanford Monacos. Left on a VW Crafter and right on a Mercedes-Benz Sprinter. Renault Master conversion by GM Coachworks for London Hire. Regulation 101 compliant VW Crafter by TBC Conversions. Interior of the new Tourys factory built minicoach version of the Iveco New Daily E6 available later this year. Mellor Maxima 30 seater on Iveco New Daily. Despite the fact that the large truck manufacturers did not take part in this year’s Commercial Vehicle Show held at the NEC Birmingham, the Show was the biggest for many years with three halls packed with over 400 exhibitors. The big truck manufacturers absence gave the van manufacturers the opportunity to take centre stage (with the exception of Mercedes-Benz) which they grasped with both hands. 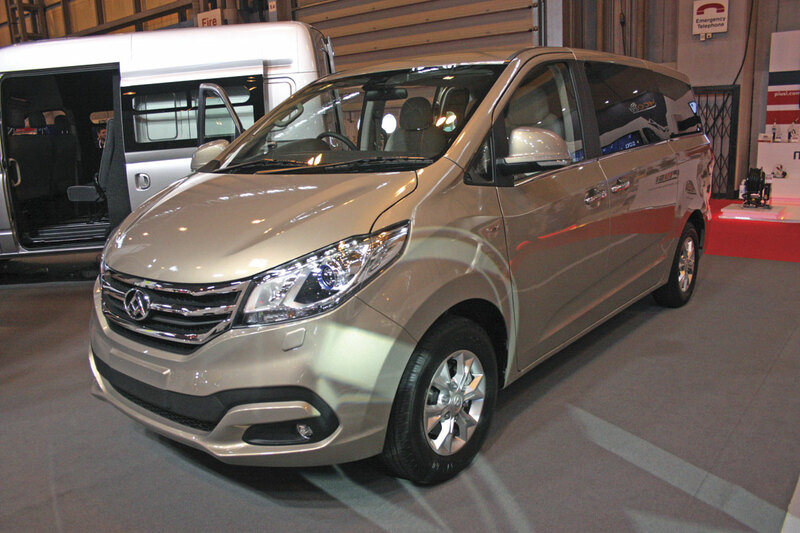 The Show saw the introduction of a number of new van models and the (re-) emergence of a new van manufacturer. Undoubtedly the biggest news was the unveiling of the new ranges of LDV vans from the Chinese manufacturer SAIC. SAIC is the company that bought Birmingham van manufacturer LDV some time ago. 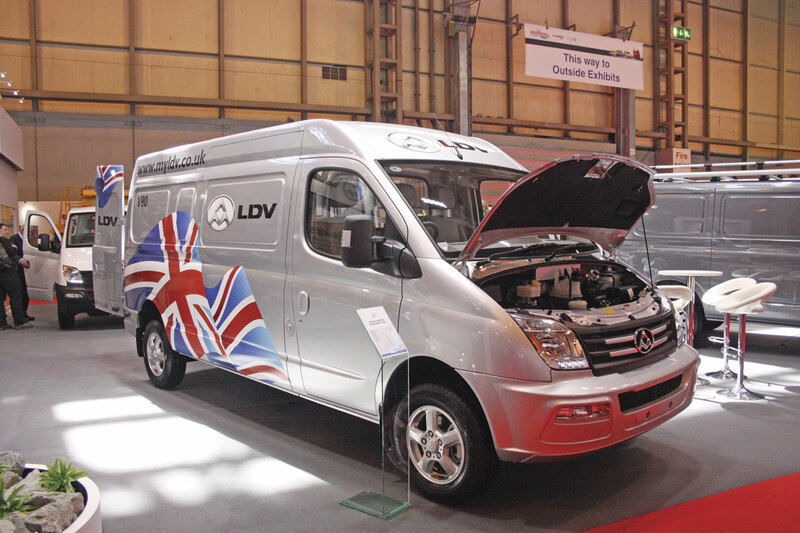 The company has spent USDollars 2.2million setting up production and developing the new LDV range and appropriately used the Birmingham show to launch its return to the UK and Ireland. The UK is one of the major van markets in the world hence its importance to van manufacturers. SAIC are not making this move alone. They have signed up with respected vehicle importers, the Harris Group of Dublin. Harris is the company that introduced the Japanese Hino truck range many years ago and has gone on to make that one of the major truck brands in the UK and Ireland particularly in the field of construction vehicles like tippers and cement mixers. Harris are in the process of setting up an extensive network of dealers for the LDV range across the UK and Ireland. Some will be existing Hino dealers but many are exclusively LDV dealers. The principal range of vans from LDV is the V80. These occupy the gross range between 3.2 and 3.5 tonnes. Initially there are three basic models, the short wheelbase, low roof model with a 3100mm wheelbase, 4950mm overall length and height of 2132mm (rated at 3.2 tonnes gvw); the long wheelbase medium height roof model with a wheelbase of 3850mm, an overall length of 5700mm and a height of 2345mm and the long wheelbase, high roof model with the same wheelbase and body length as the medium van version but an overall height of 2552mm. The medium and high long wheelbase models gross at 3.5tonnes. I would suggest that it is primarily the last model that will interest minibus converters. Also of interest will be the chassis cab range. The standard chassis cab has a wheelbase of 3850mm which allows a maximum overall length of between 3350 and 3660mm but there is also a version with a longer rear overhang which extends the body space by a further 675mm. The front axle of the heaviest duty model is rated at 1.7 tonnes and the rear at 1.8 tonnes. Suspension uses taper leaf springs with Macpherson struts at the front. Steering is hydraulically powered and braking uses discs all-round. The vehicles are mounted on 16in wheels with 215/75R 16C tyres. The vehicles are powered by the VM Motori-Eco 2.5 litre turbocharged, intercooled, common rail diesel engine which is produced in Italy. The engine is a four cylinder diesel to Euro5b with EGR for emission control. The engine produces 136bhp (100kW) at 3600rpm and has a maximum torque figure of 330Nm across a wide speed range from 1800 to 2600rpm. Transmission is six speed synchromesh and the vehicle has front wheel drive. Although this new vehicle is developed from what was the LDV Maxus and indeed some of the machinery moved from the old LDV plant in Birmingham to China is used in its manufacture, this is a very different vehicle which bristles with innovation. Standard are ABS, EBD, BAS and ESP. The body structure also benefits from SSIPS. Other features are LED headlights, electrically adjusted and heated mirrors which incorporate turn indicators, reversing sensors, cruise control, powered cab windows and remote central locking. The driver has a fully adjustable seat with armrests, driver and passenger airbags, air conditioning and FM/AM radio, MP3 player and Bluetooth connectivity. At present SAIC do not have plans to bring in a factory supplied minibus version though this may follow in time. I have no doubt our ever resourceful conversion industry will soon satisfy demand for that product. Also launched at the Show was an all electric version, EV80, which will be available next year. This uses a high powered permanent magnet, synchromesh motor which produces similar power and torque to the diesel engine. It uses lithium iron phosphate batteries and LDV claim the vehicle has a range of 310km and can be charged in two hours. As more and more low emission zones are introduced and existing ones are tightened, I predict vehicles like this will become increasingly popular for city centre work. Although the standard LDV V80 will not be available in minibus form, the electric version will be. There will be two versions of the long wheelbase model with either medium or high roof. Indicated maximum seated capacity is 15 but this probably includes the driver. As if the V80 launch wasn’t enough, Harris/SAIC also introduced a van and smaller people mover, the G10, which can seat up to eight people. Full details are not yet known but will be announced later this year with deliveries in early 2017. The Show was the first public event for the new Iveco New Daily E6 range with the new Euro6 diesel engines. I don’t intend to go into details about the Daily E6 here because my colleague Stuart did that comprehensively in last week’s issue. Of particular interest at the Show was the announcement of a new range of factory supplied minibuses including the top of the range Tourys minicoach version of the New Daily which will be available here from about September. The New Daily Tourys features up to 22 reclining seats and has 2.5cu.m of luggage space. New standard features like LED lights and individual air conditioning vents can be complemented with other options including a new multi-media system incorporating satellite navigation system, reversing camera and LCD monitor. Among the other equipment options available are USB and phone ports at every seat, a drinks fridge and a coffee machine beside the driver. The innovative eight-speed Hi-Matic automatic gearbox comes as standard equipment on the New Daily E6 Tourys. CNG or full electric options are available. 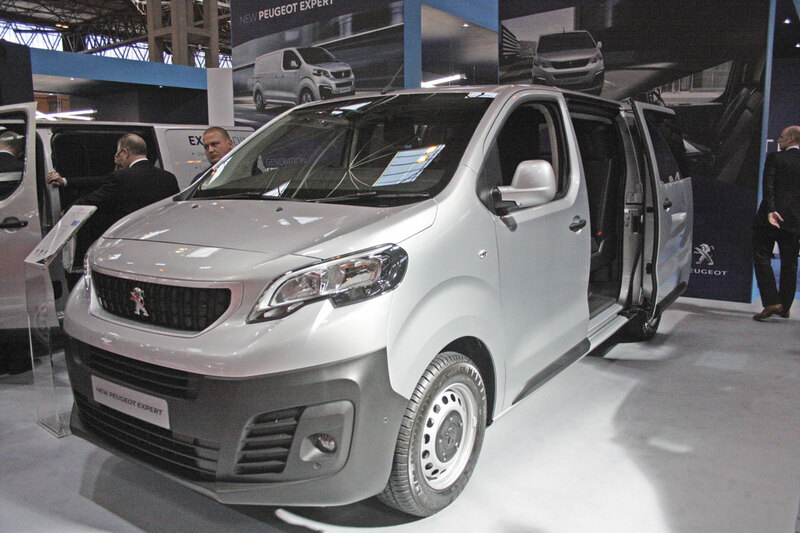 After Renault launched its new Trafic mid range van last year, it was the turn this year of Peugeot and Citroen to introduce their versions of the same base vehicle known as the Peugeot Expert and the Citroen Dispatch. The new Peugeot Expert is available in three body lengths and offers up to 6.6m3 of carrying space and up to 1400kg of load weight with a potential length of 4m. The Standard and Long versions, at 4.95m and 5.30m, are the main models but there is also a compact 4.60m version which allows loads of up to 5.1m3 and 1400kg, with a useful length of 3.32m. The new Euro6 BlueHDi engine options range from 95bhp to 180hp offering maximum torque of 210 to 400Nm, most are equipped with Stop/Start technology. There are two types of transmission, the new BlueHDi 180 EAT6, six speed gearbox or the BlueHDi 95 ETG6 six speed electronic automated gearbox. The Combi MPV versions are available in three body lengths for between two and nine passengers. With nine people aboard the boot volume is up to 1,300 litres but this can be increased to 4,900 litres with removable rear seat rows. There is also a platform cab variant with 3.275m wheelbase for coachbuilt bodywork. 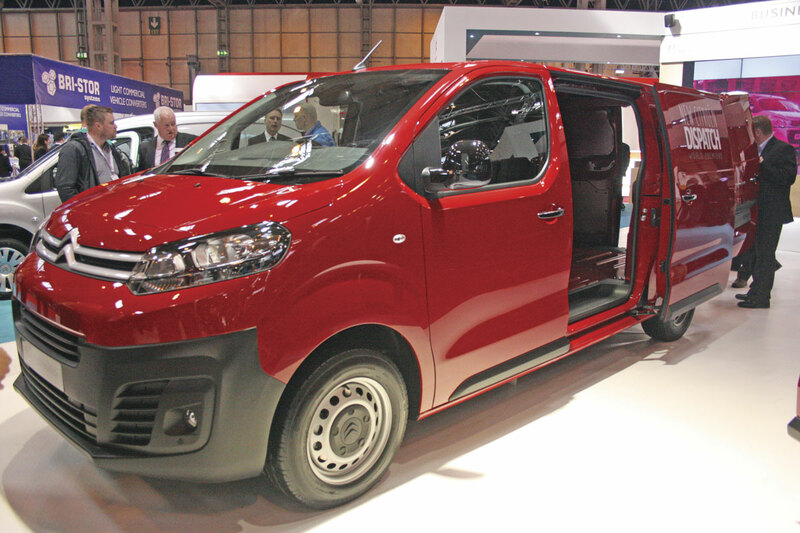 The mechanically similar new Citroen Dispatch is available as a van or a combi in three lengths, the XS at 4.60m, the M at 4.95m and the XL at 5.30m. The XS is a new variant to the range. The vehicles offer up to 6.6cu.m of volume space. The largest of the Combis can seat eight passengers plus the driver. There are two wheelbases at 2.93m and 3.82m and two rear overhangs at 0.80m and 1.15m. Other areas of commonality between the two models include hands free operation of the side sliding door, 180 degree Park Assist, colour head-up display and ConnectNav voice connected 3D satellite navigation. Finally amongst the van manufacturers, VW showed full production versions of its new T6 Transporter range of vans and minibuses which were reviewed in B&CB last autumn. As usual a number of well known converters chose the CV Show as a platform to promote their products. Some like Treka Bus and TBC had their own stands whilst others displayed their products on the stands of heating and ventilation specialists Eberspacher and Webasto. Treka Bus showed on all three sites. On their own stand they had a Mercedes-Benz Sprinter based Treka 16 coachbuilt, 16 seater wheelchair accessible example for London Hire. The vehicle featured a number of new features including a new single side panel, flashing seat belt reminder sign, audible turning left warning system and other detail changes which will all become standard features on their vehicles. The other vehicle on their stand was the less common 16 seat Treka 16 van conversion of the five tonne Sprinter van. 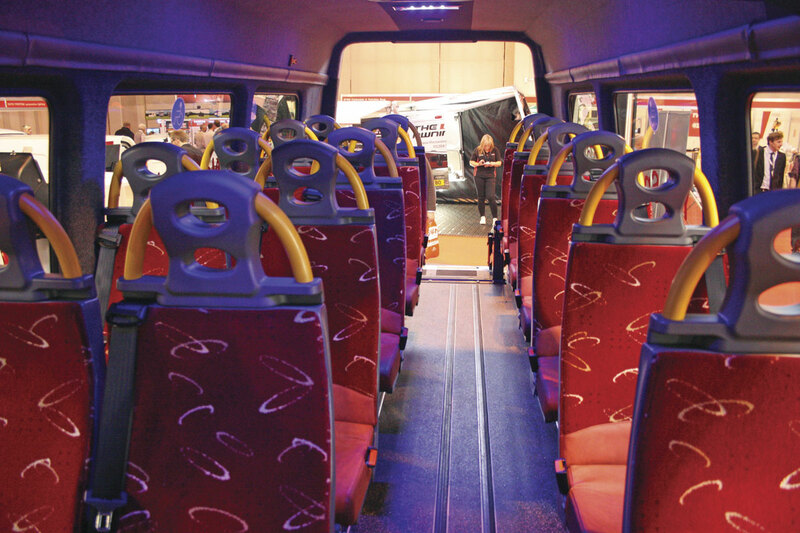 The vehicle was one of a batch they are building for Essex County Council’s Community Link and featured seating for 15 or alternatively five wheelchairs and a PLS rear underfloor lift. Treka Bus production is currently running at seven vehicles a week. Another coachbuilt Treka 16 Sprinter appeared on the Webasto stand in the colours of Dawsonrentals and yet another on the Eberspacher stand, this time for Transport Service Solutions which is part of Enterprise Hire who recently absorbed the former Burnt Tree Access-a-Bus operation. Stanford showed examples of their high end Monaco luxury minicoaches. On the Webasto stand they had a conversion of a VW Crafter. The vehicle had eight luxury recliners with four set at tables, luxury internal finish and mood lighting, fridge and an advanced in-coach entertainment and communication system. The quality of the conversion was as usual outstanding. If you were impressed by that vehicle, their exhibit of a Mercedes-Benz Sprinter 313, on the Eberspacher stand, took that a step further. This had just six very luxurious seats, coffee maker, fridge and entertainment package plus an even more advanced in-vehicle entertainment package with the largest plasma screen I have ever seen in a minicoach. However, the vehicle they had in the outside demonstration area was of more interest, their first conversion of an Iveco New Daily 50C17. The vehicle had seating for 16 passengers or one seated plus eight wheelchairs but can be seated at up to 22 passengers. It had rear air suspension and was fitted with the new lightweight aluminium alloy PLS tail lift which has a 1500mm x 950mm platform and can lift 400kg. 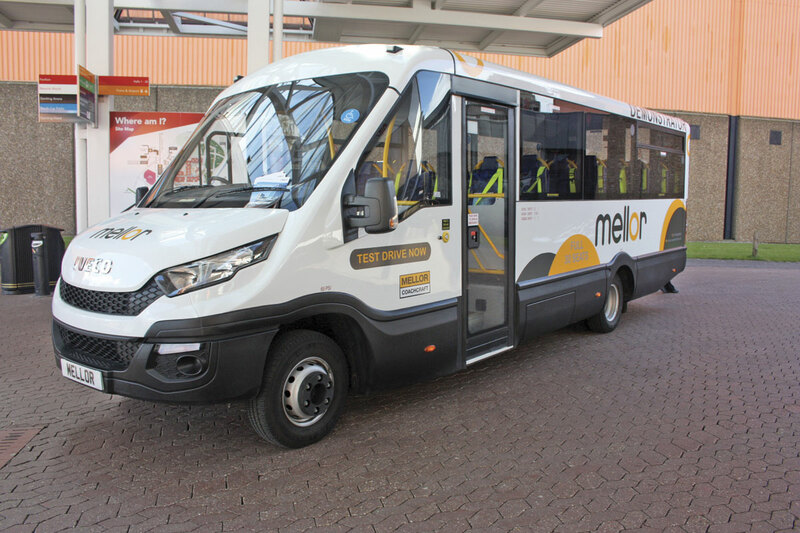 Mellor Coachcraft showed two of their front line coachbuilt models, the Orion directly wheelchair accessible minibus and the new Maxima 30 seater. 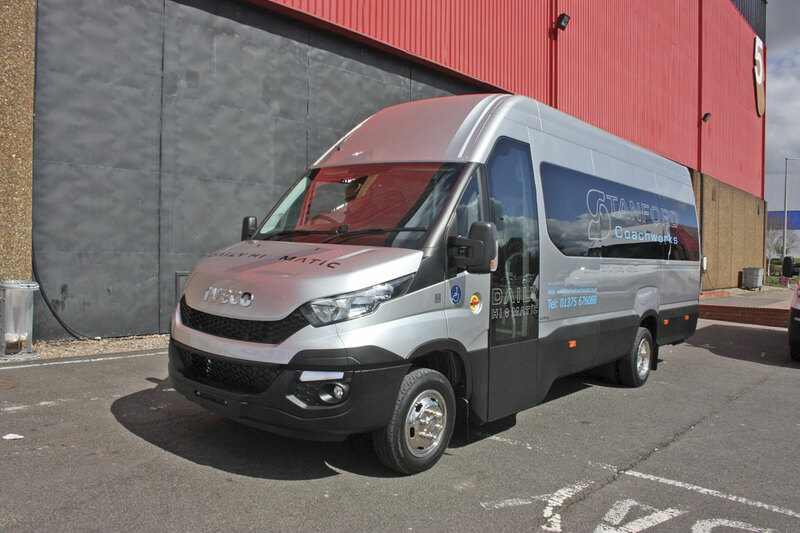 The Orion uses a Fiat Ducato front end blended into Mellor’s own low-line chassis frame. Two base versions are produced, an accessible version with rear loading of wheelchairs via a gently sloping ramp and a service bus version with direct wheelchair access through the side entrance. 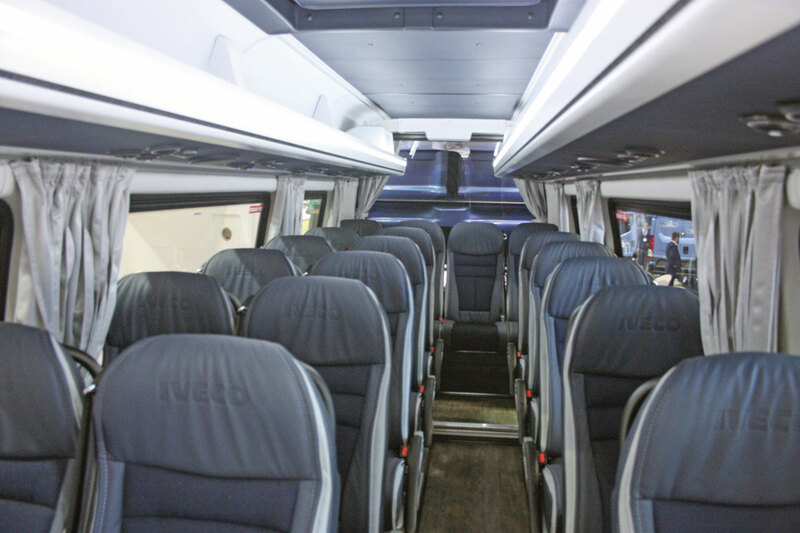 The example on show was an accessible version with seating for 16 or up to six wheelchairs although Orions can be seated up to 22 passengers. The Maxima is built on the New Iveco Daily fitted with the eight speed Hi-Matic automatic transmission or six speed manual transmission and can be seated at up to 30. The vehicle can also be adapted easily to carry up to eight wheelchairs which are loaded through the rear doors. A range of underfloor cassette type and in-board lifts are available. The example on show was fitted with a Ratcliff lift. Mellor report excellent sales of this new model since its launch was reported in B&CB. 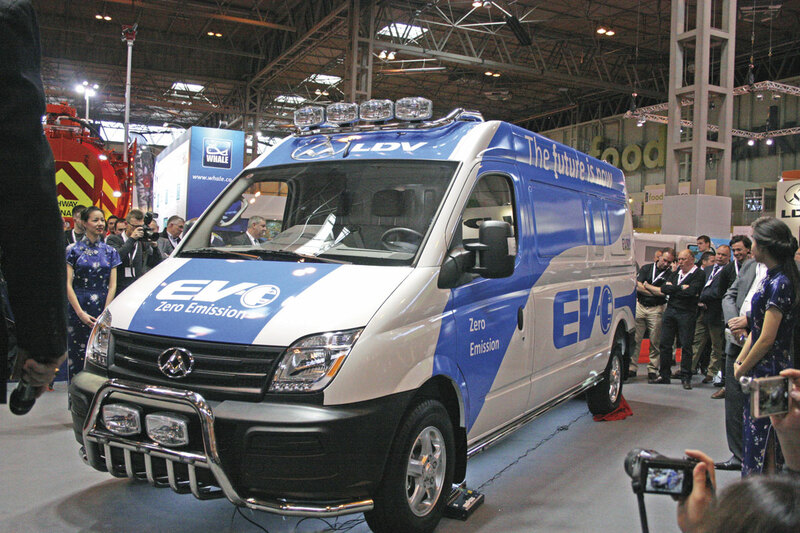 GM are the specialists at converting the Peugeot Boxer and showed one of their popular conversions. The vehicle featured their now familiar fold out entrance steps with integral handrails and a rear in-board PLS lift. The vehicle could carry 13 passengers or up to five wheelchairs and two seated passengers. 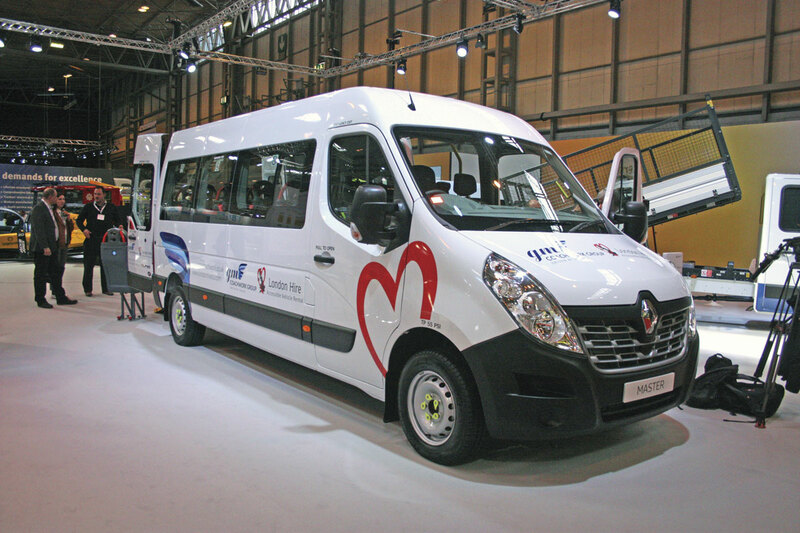 On the Renault stand they showed a Renault Master, one of a batch they have built for new customer London Hire. The vehicle had seating for 16 or 12 plus one wheelchair loaded via a ramp. Nu-Track showed their directly wheelchair accessible contender in the shape of the City Dash which was recently featured in detail in these pages. TBC took some finding, about as far as they could be from the other minibus exhibits. 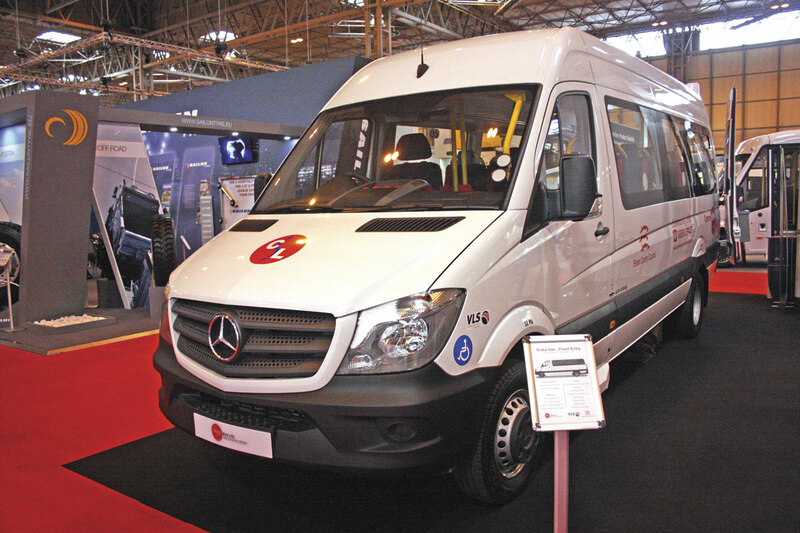 This was the company’s first solo stand at the CV Show and because they were showing commercial vehicle products as well as a minibus they had been placed in that section. On their stand they had a very tidy conversion of a VW Crafter CR50 proudly exclaiming its compliance to Regulation 101. The vehicle featured an extra step at the side entrance and seating for 16 or six wheelchairs. It was fitted with a Braun in-board wheelchair lift at the rear. As ever the CV Show produced plenty to interest a bus man with lots of new base models and some very interesting conversions. Who, I wonder, will be the first to show us a minibus conversion of the new LDV V80 and will we at last start to see relatively cheap electric minibuses taking to our streets?